Those among you who are warily eyeing a pair of odd-looking leeks in your veg box, fear not. Welcome to the world of wet garlic. Essentially ordinary garlic harvested before the bulb and cloves are fully formed, wet garlic deserves no less a place in your cooking than its older, dried brethren. It is milder and sweeter in flavour, and works well in every dish you would use dried garlic in, just add it later in the cooking process and use more of it. For the more adventurous, try it chopped straight into salads, stir fries or risotto, or even to jazz up your scrambled eggs. Don’t be afraid to use the whole thing – bulb, stalk and even leaves, provided they are in good condition. Growing garlic is relatively pain-free as far as pests and diseases are concerned, no doubt partly thanks to its natural pungency. The fiddliest part of its cultivation is in the planting itself. Firstly the cloves have to be separated from the bulbs – picture a circle of people among bulging sacks, boxes of cloves, mounds of floaty, papery vegetation and a pervading whiff of garlic, and you get the idea. When it comes to planting in October, the cloves have to be put in the soil pointed-end-up, as otherwise the shoot has to make a u-turn, wasting precious time and energy in the process and generally resulting in a weaker plant. Because of this little idiosyncrasy, garlic must be planted by hand. 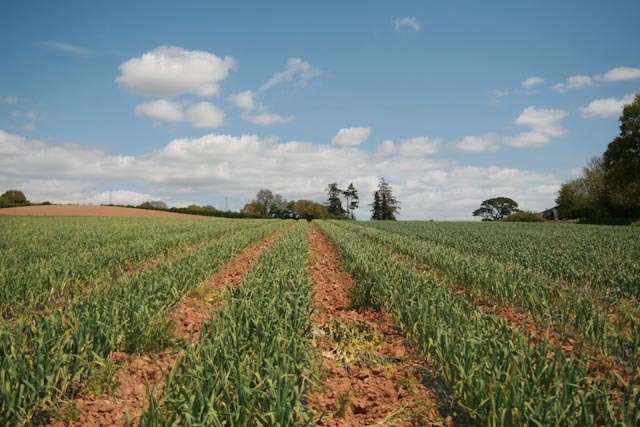 For the acre and a half of garlic we have growing here in Devon that meant placing over 100,000 cloves within five days; quite a task for our harvest manager, Martin, and his team. 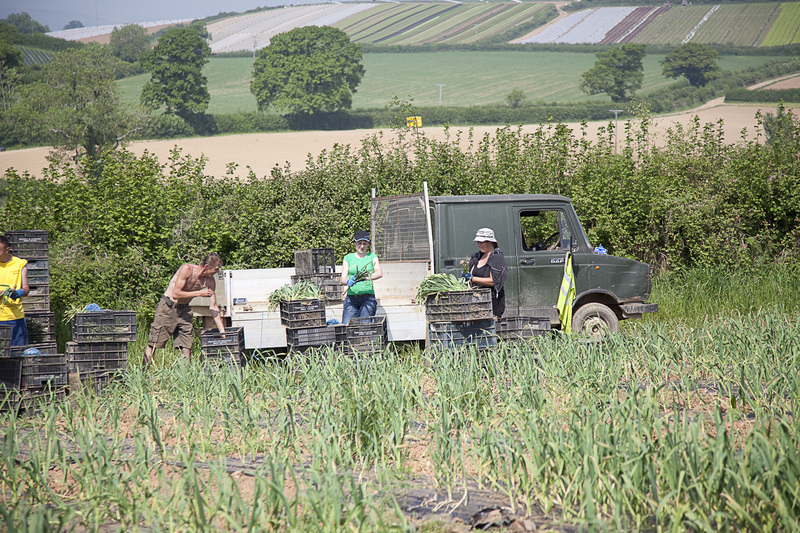 We took a trip to one of the fields on our farm in Devon to see wet garlic being picked for the boxes. We laid mulch across the field in September last year then planted the garlic in late October and early November. We used a mechanical dibber to punch little holes into the mulch, and then planted garlic through them. 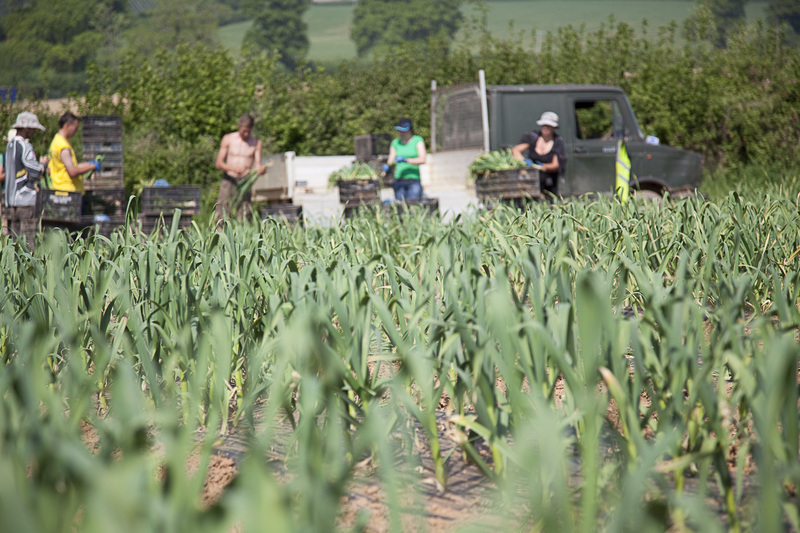 The field workers pick the garlic in May and June by pulling it out of the ground. They then fold two of them over to make a bunch for the vegboxes. Add sliced wet garlic to roast new potatoes about 10 minutes before the end of cooking. Try a recipe for roast wet garlic and goat’s cheese toast here.